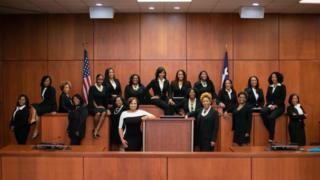 A photograph of 19 black female judges in one Texas county has been widely celebrated. It is the largest number of black women seen on the ballot in Harris County, says their campaign website. The picture, dubbed the Houston 19, taken in August when the women assembled as part of their "Harris Black Girl Magic" campaign for office, trended on Reddit and Twitter. Seventeen were elected on Tuesday, in addition to two already in post. LaShawn A Williams posted the picture on Facebook, writing: "Never did I imagine that the day I decided to run to be judge, I'd become a part of a club of phenomenal black women, sisters-in-law, gifted, brilliant, strong - everything I hope to be!" Their victory adds to the long lists of firsts across the nation, with the most diverse range of candidates ever elected to Congress, including 111 women. Using #Houston19, many celebrated the election of officials they believe more closely reflect the communities in Texas they represent. Others said it was a credit to Texan diversity and character, something not always portrayed in popular culture. The women ran together on a Democratic ticket, and they appeared on posters around the county with the slogan "Let's Make History"
With 4.5 million people, Harris county is the largest in Texas, and the third largest in the US. It has a diverse population with 42 % Hispanic, 30% white and 17% black. Elected country judges in Texas have judicial and administrative duties, including presiding over minor criminal cases and small civil cases. Most of the new judges were born and educated in Houston and have spent at least a decade working in local law firms. In her bid for election, Germaine Tanner, elected to the 311th Family Court, described visiting inmates in jails for the Fatherhood Project in Harris County which aims to empower fathers. Another of the new judges, Michelle Moore, explained on her website a three-pronged approach of "rehabilitation, mentorship and education" for working with "troubled youth". Latosha Lewis Payne told local media: "I think that having an African American judge or having a female judge - those are the kinds of things we bring to the bench. And we bring an understanding of a person who may come from that similar background."